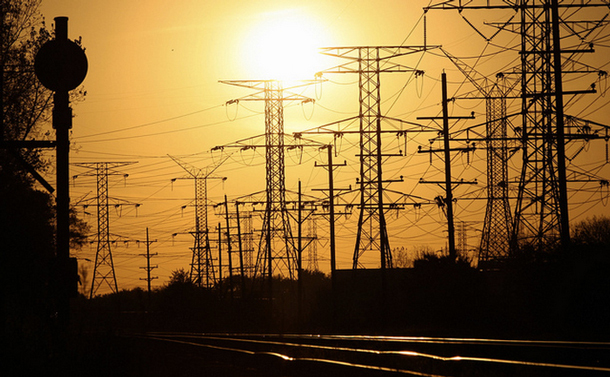 Does electricity aggregation do enough for renewable energy? Transmission lines in Des Plaines, Ill.
A wind farm in Pontiac, Ill. When Chicagoans voted for electricity aggregation in 2012, becoming the largest city in the U.S. to do so, they gave the city power to negotiate a new price for electricity on their behalf. Pooling customers saves money, but it also gives them a unified voice that they can use to demand renewable energy. Somewhat ironically, however, state requirements meant to encourage renewable energy development in Illinois could dampen aggregation’s potential to do just that. The state’s Renewable Portfolio Standard requires Illinois energy suppliers purchase 25 percent of their power from renewable sources by 2025. But they can meet half of that requirement by buying renewable energy credits (RECs) from out-of-state producers. A quirk in the law could actually prevent money collected through aggregation for the purpose of funding renewable energy from spurring any new renewable development. Jack Darin of the Sierra Club hopes the state will fix that glitch. Even if it does, cities buying renewable energy are actually buying credits— not renewably generated electricity itself. “RECs are renewable energy derivatives, essentially,” said Kevin Borgia, policy manager for Wind on the Wires. 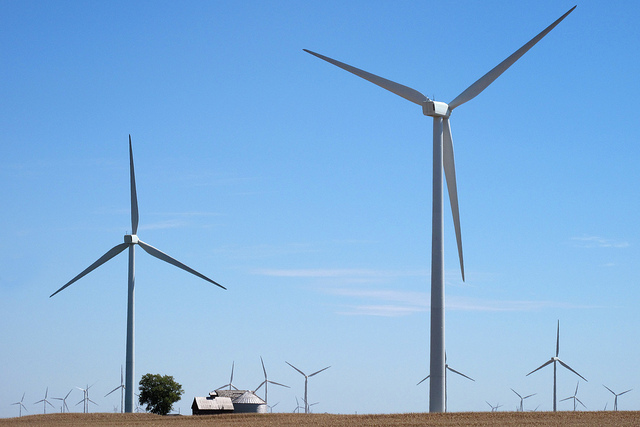 A wind farm in Texas, where there is no state requirement for renewable energy, could build up RECs that would find their way to Illinois towns looking to meet the standards they set forth in an aggregation deal. Since the state allowed aggregation in 2009, more than 200 Illinois communities have approved their own deals. Elgin’s contract with Direct Energy costs 4.915 cents per kilowatt-hour and is 100 percent renewable. Oak Forest pays an extra eight-tenths of a penny per kWh to purchase enough renewable energy credits to cover 100 percent of the town’s power. Evanston and Oak Park have also pursued 100 percent renewable power. But that doesn’t mean every light bulb in those cities is channeling wind energy. The Illinois house this week passed legislation that spelled out ratepayers’ right to know the source of their power. Chicago is large enough to command the market’s attention, but small towns don’t have energy experts advising them. Darin of the Sierra Club said the new state law might inspire other aggregated communities to push for more green energy. According to the Northern Illinois Municipal Electric Collaborative, 40 percent of their municipal clients that opt for a renewable energy rate hike go for full renewable coverage. Chicago struck a two-year contract with Integrys Energy Services, replacing Exelon subsidiary Commonwealth Edison and reportedly saving households $150 on average per year by 2015. Energy prices change daily, and low prices are not guaranteed forever, but the contract requires Integrys to provide electricity cheaper than ComEd, and gives the city an option to switch after May 2014. It also banned coal, which provides roughly 40 percent of Chicago’s power, from the city’s fuel mix. A spokeswoman from Integrys said the majority of that displaced power would come from natural gas. Compare that to San Francisco. The city’s CleanPowerSF program is focused on providing consumers with more renewable energy. It offers 100 percent green power, mainly from wind, with an opt-out choice for customers who do not want to pay more for renewable energy. It’s also rolled out gradually, with only 90,000 customers enrolled this year and the rest over the next two years. And it has the option of direct purchasing, so ratepayers buy renewable energy instead of credits. In Chicago aggregation was an easy sell — prices fell immediately. In contrast with Chicago’s Emanuel-driven 50-0 vote, three of San Francisco’s 11 City Council members were against the proposal, and so was the mayor. The two deals, though similar in size, come from a different set of circumstances. California’s Renewable Portfolio Standard is more demanding than Illinois&apos; (33 percent by 2020 vs. Illinois’ 25 percent by 2025). But researchers at Yale and George Mason universities found 88 percent of Americans say the U.S. should make an effort to reduce global warming, even if it has economic costs. If ratepayers demand it, renewable energy (not just credits) could make up a greater share of the fuel mix in communities that have approved aggregation. And if the two-year deal works out, analysts like Borgia hope Chicago will look at longer contracts. A new wind farm won’t likely turn a profit in just two years, so a longer contract could spur wind and solar farm construction and bring in-state jobs, while providing a hedge against future fluctuations in the price of fossil fuels like natural gas. Chris Bentley writes about environmental issues. Follow him on Twitter at @Cementley.